Derry City winger, Adrian Delap has been in fine form this season. ADRIAN DELAP is hoping his fine form with Derry City will open the door for a call-up to the Republic of Ireland U21 squad during the 2021 UEFA European Championships qualifying campaign. The 20 year-old Donegal lad was considered by U21 boss, Stephen Kenny for Sunday’s opening qualifier against Luxembourg at Tallaght Stadium and placed on the stand-by list. With the former Derry City and Dundalk boss in charge of the U21 set-up until he takes over from Mick McCarthy in 2020, Delap believes the Dubliner will continue to give SSE Airtricity League players their chance on the international stage. 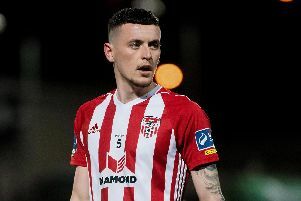 Kenny has already picked NINE League of Ireland players in his first U21 squad and Delap hopes he can continue to impress with the Candy Stripes and earn his first cap in the coming months. “It’s good to be mentioned and it’s good that Stephen is the manager because he knows a lot of players around the league and knows what he wants,” said Delap. “As long as I keep getting minutes under my belt with Derry, you never know what might happen. “Obviously everyone wants to play football for their country and it would be a massive achievement for me. It’s just about putting your head down and working hard - that’s the most important thing for me to do at the minute and maybe I might get a bit of luck somewhere down the line. Kenny was present at the Ryan McBride Brandywell Stadium as Delap impressed in the second half of the win over Waterford and was also at Dalymount Park as the winger ran experienced Bohs defender, Derek Pender ragged during the opening 45 minutes. There’s not too many direct, pacy wingers like Delap in the league at present and the player admits he’s flourishing under the tutelage of Declan Devine and his management team who encourage him to play his natural game. “When Decky first came in both him and Kevin (Deery) just told me to go and play your own game. And with Paddy McCourt there training with us now and again, I suppose you can’t get much better to learn from.